Russian paper artist Asya Kozina from St. Petersburg creates very stylish and sophisticated paper sculptures. In her portfolio there are ethnic wedding dresses, white fluttering butterflies, and detailed flowers. In addiotion to paper art, she is a fashion designer. Her paper sculptural installations from the series “Ethnic wedding dress” prove this. According to the artist, preparing for her own wedding day she found out the huge variety of national wedding dresses in different countries. Unfortunately, the ancient traditions rooted in the past are slowly dying out. The desire to prevent the disappearance of this unique world has become the basis for creating the fragile paper collection of bridal dresses. 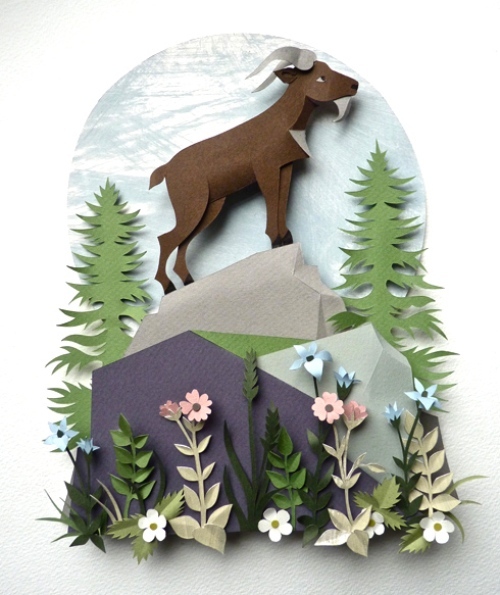 Paper artist Helen Musselwhite works in her home studio, creating fabulous paper art with an ordinary set of tools. In particular, a table, reference books, lots of discarded scalpel blades and drawers full of paper. The result is impressive. According to Helen, she loves working with paper so much that she can get totally lost in what she is doing. And the time passes for her without noticing. She thinks that paper is a good medium. “As you can make it – as good as your own creativity, and that’s a fantastic challenge”. Her pieces usually start with some quick thumbnail sketch. She enlarges this and works from it. Helen Musselwhite loves to work on large-scale projects for brands and small commissions for private clients. In fact, the Japanese use Washi paper in many traditional arts. 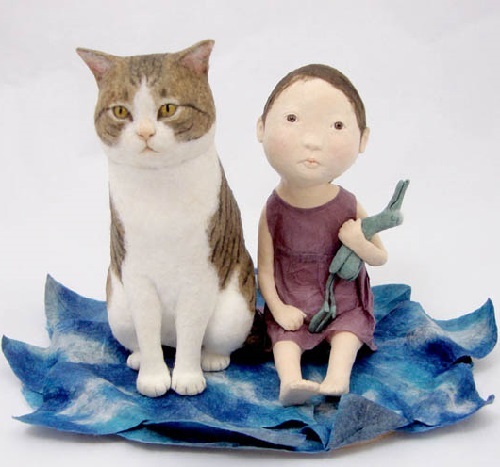 And Japanese paper artist Kyoko Hazama also creates cute miniature sculptures out of this durable and rigid paper. According to Kyoko Hazama, she has been used Washi paper since childhood, first as a game, then, at her twenties – created miniature sculptures. Meanwhile, every sculpture begins with an idea drawn in a sketch. 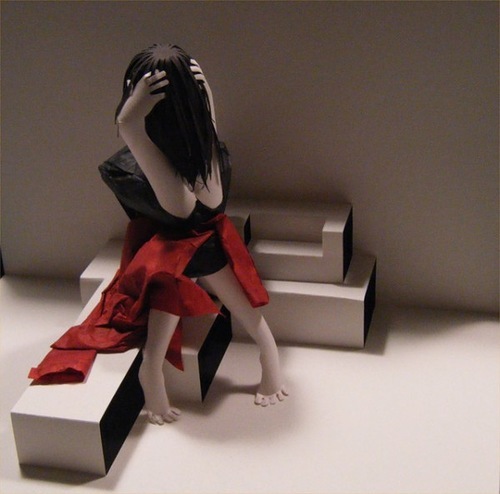 Using different colors of paper, layer by layer, Kyoko Hazama constructs her cartoon-like figurines. Noteworthy, the main inspiration for Kyoko Hazama became facial expressions of animated cartoon characters from the Czech Republic. Anyway, the art of Kyoko Hazama originates from the traditional Japanese folk art dolls combined with her individual view and feelings. Her miniature human sculptures, which are mostly girls – depict her personality, they are symbolic self-portraits. 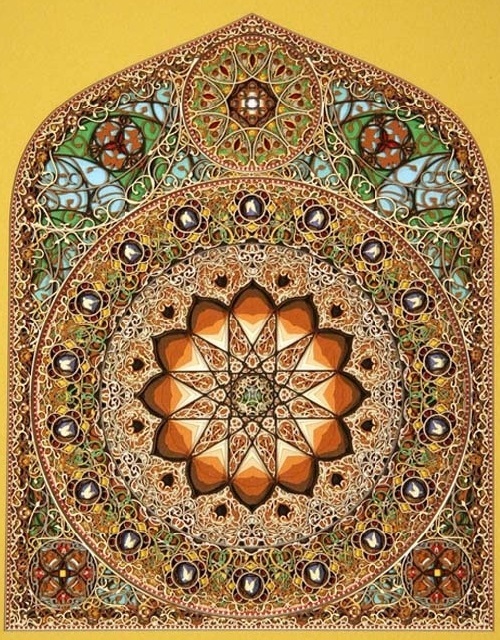 Inspired by Gothic geometry and Islamic architectural ornamentation, American artist creates fabulous artworks of paper. Meanwhile, the artist has his unique individual style. Eric Standley got his B.F.A. after graduating from the Massachusetts College of Art and M.F.A. from Savannah College of Art and Design. He is an Associate Professor of Studio Art and the Foundations of Art and Design Coordinator for the School of Visual Arts at Virginia Tech. According to the artist, he sleeps on rare occasions and dreams that with hard work and concentration he might one day become a modernist. Standley holds allegiance to a faith of his own construction, reinvented on a daily basis. British paper sculptor Sher Christopher creates amazing things from paper, they look like origami, but they are not. Her sculptures and portraits are complex and expressive, as if they live their own fairytale paper-life. Noyeworthy, she manages to convey complex emotions … For instance, this young woman whose pain is palpable. According to Sher Christopher, the sculpture ‘Sorrow’ is a very, very personal piece, an auto-biographical one. In 2009 Sher’s Mum was diagnosed with cancer, with a brain tumor, and had only a few months left to live. It was the most devastating news. Sher couldn’t work at the time, and was utterly lost. This image was a recurring one in her thoughts and dreams, and the only image that began to express how she felt. In fact, this is one of the oldest kinds of art, and its first traces – found in ancient China. The explanation is very simple – paper cut art appeared with the invention of paper in China. The ancient masters drew on paper, wrote Chinese characters, and used for government documents. However, the Chinese have gone even further. 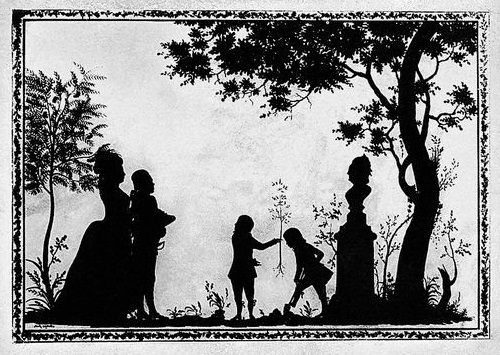 They used to cut silhouettes out of paper, stack them on the window, and the whole effect of this appeared in the evening, when the light lit the windows. Also, different cut silhouettes belonged to different national beliefs of the Chinese. Landscape designer by education, Chilean artist Jose Romussi has become known for his embroidered prints and collages. 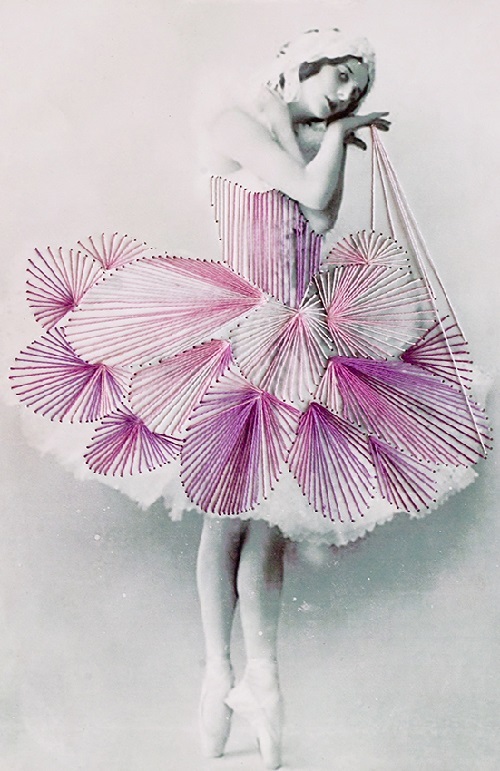 This series of thread art features vintage ballet dancers of the Ballets Russes, who were real stars of the time. In particular, Anna Pavlova, Vaslav Nijinsky, Alla Shelest, Tamara Karsavina, Olga Spessivtseva, Diana Gould, Susie Presley, and Diana Adams. Inspired by vintage black & white photographs, Romussi uses them as the base for stitching colorful thread lines to the picture, thus giving the old costumes a new vision. Since 2011 the self-taught visual artist Jose Romussi lives and works in Berlin.